The first sighting I had of the T-U-F-I village on Cape Nelson from our Orion Expedition ship was the 4 letters spelling it out in rocks on the bank of the Solomon Sea. There were just rocks on the green grass and trees and the Solomon Sea. Then we started to see outrigger canoes coming towards us. 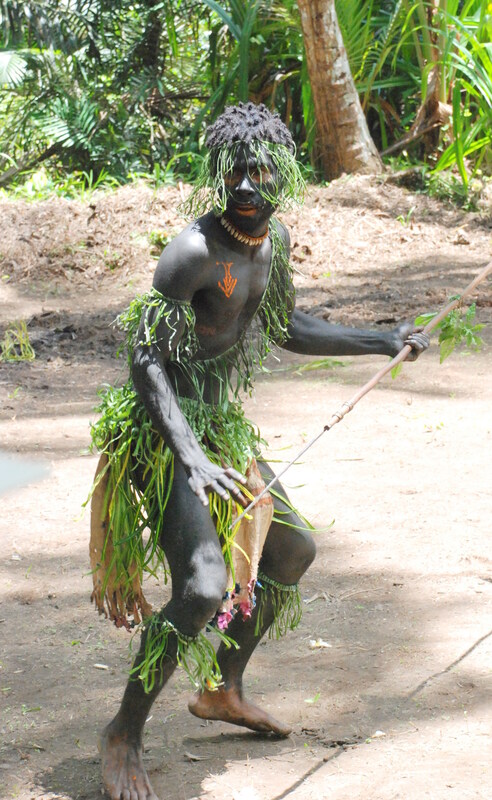 An almost-naked native, with strategically-placed leaves and vines, greeted us and helped us into his canoe. We glided on a narrow 300-feet deep fjord lake covered by mangrove trees for about a quarter of a mile until he took us to the landing point. 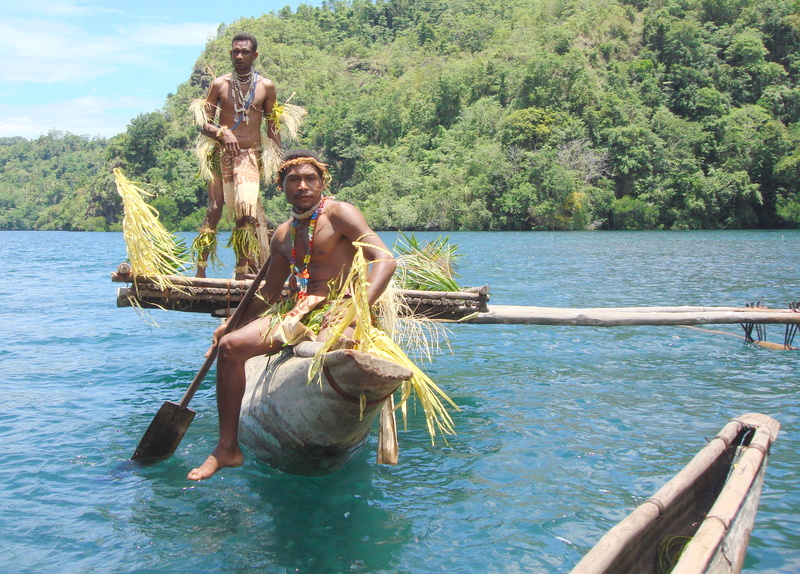 We were among the first tourists to Tufi on a expeditionary cruise by Tauck World Discovery. Two men covered in black paint with big red outlined eyes and spears in hand, ran up to us, screaming and shouting and motioning us to stop. This posturing continued for several minutes in an attempt to get us to leave their village because this was their ancient way of preventing enemies from harming their village and people. 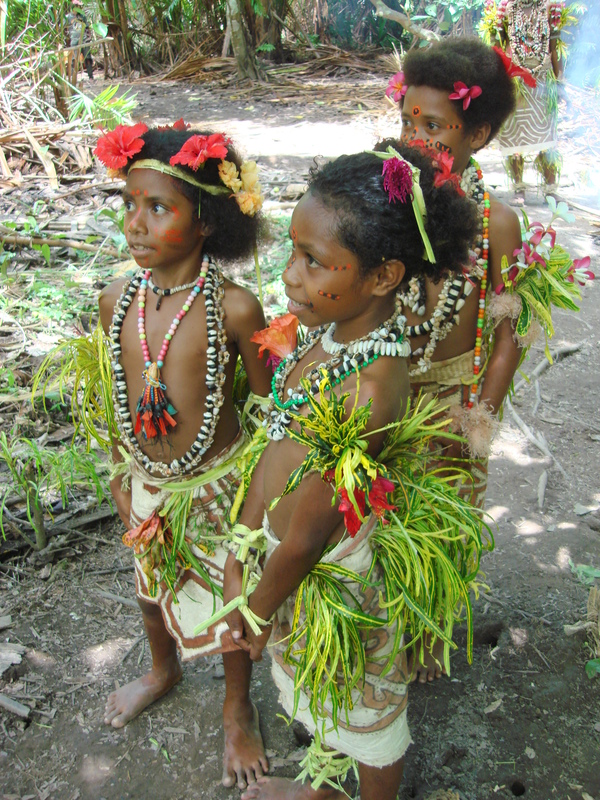 Finally, determined that we were safe, we were welcomed with a fresh-flower lei that had just been made for our visit to Tufi, Papua New Guinea. 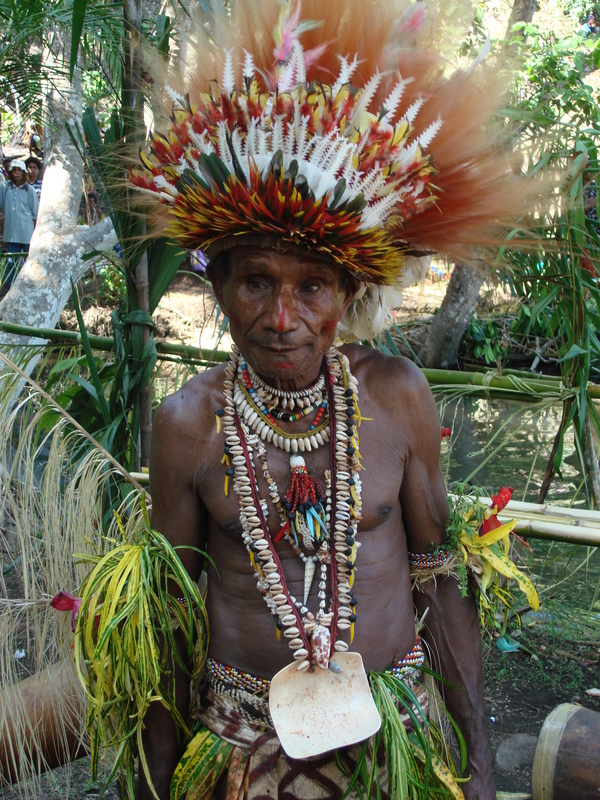 Wearing the most regal, glorious, and colorful primitive tribal decorations, the village chief greeted us, along with 30-40 of his villagers, also displaying their outstanding tribal village bilas finery. The natives showed us around their village. 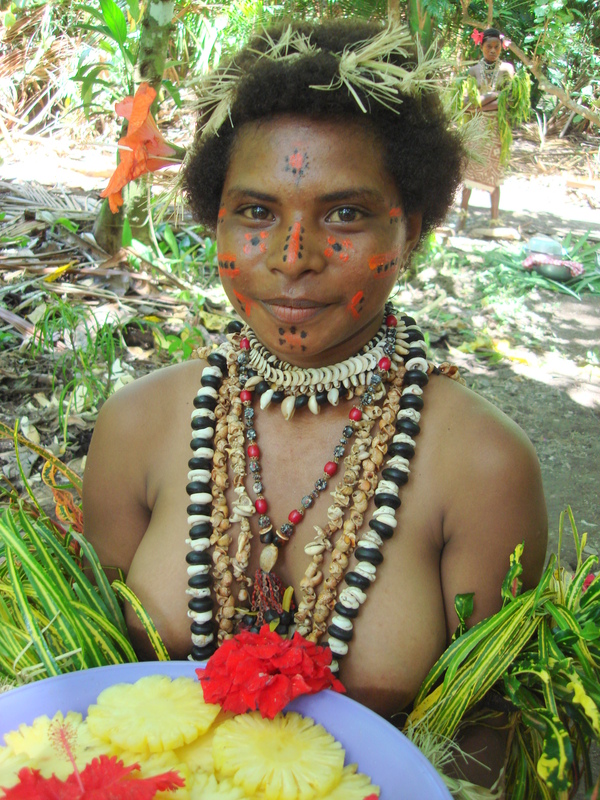 And, dressed in their spectacular attire and tapa cloth skirts, they showed us how they take a sago palm tree, hollow it out, wash, shred and shape it into food. 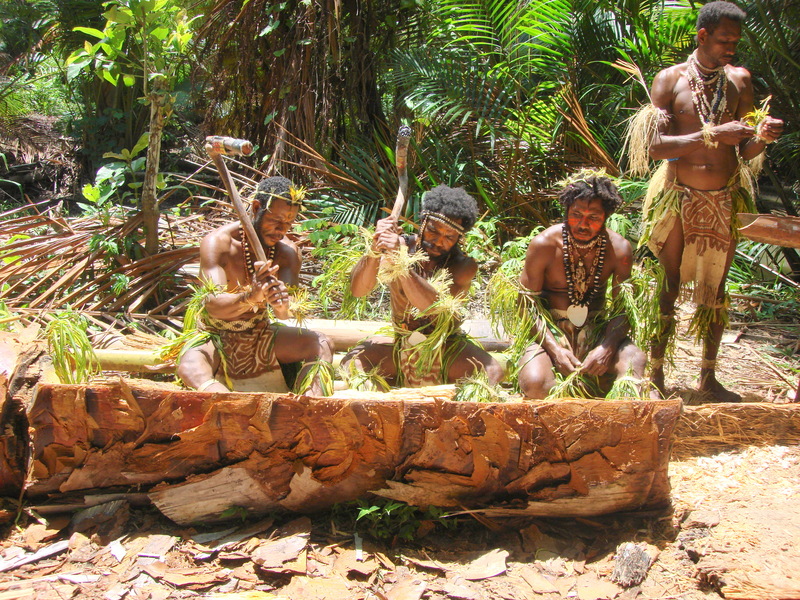 The men did the chopping and hollowing and the women did the cooking of the sago palm flakes over an open fire and shaped it into an oblong loaf for use later as flour or bread. It was wrapped only in leaves for storage. Then it was time for fresh pineapple, cut like a pinwheel, and displayed on a tray for us to enjoy. We all made sure we took a pineapple “flower” from the lovely lady with the sweet smiling face and adorned in the island’s ceremonial decorations. Native crafts were spread out on the ground for us to souvenir shop in Tufi, Papua New Guinea, a country just opened to tourism. Yes, even souvenir shops are in countries that have only recently seen a white man. The villagers offered to sell their handmade items of bowls, plates, tapa cloths and necklaces made of bones, wood, shells, and rocks and anything else they could find in the jungle. And yes, I have a Papua New Guinea shell necklace to go with my African print blouse and tapa cloth for a skirt, and an inlaid wood plate for entertaining. As I shopped for the unusual souvenirs, I noticed one of the village women lying on the ground and another native lady working on her. 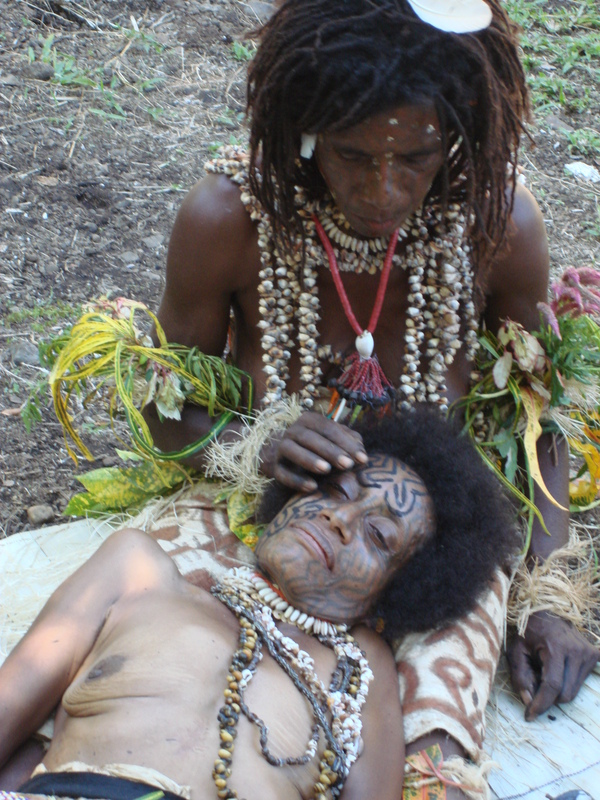 She was tattooing the lady’s face, the highest fashion and sign of beauty one can have in Tufi. The tattoo was a zigzag pattern, and I then noticed several other women there had that tattoo pattern on their face and chest also. Before we left, the villagers performed a tribal dance for us and marched right by us, giving a great opportunity to see and to photograph each one. 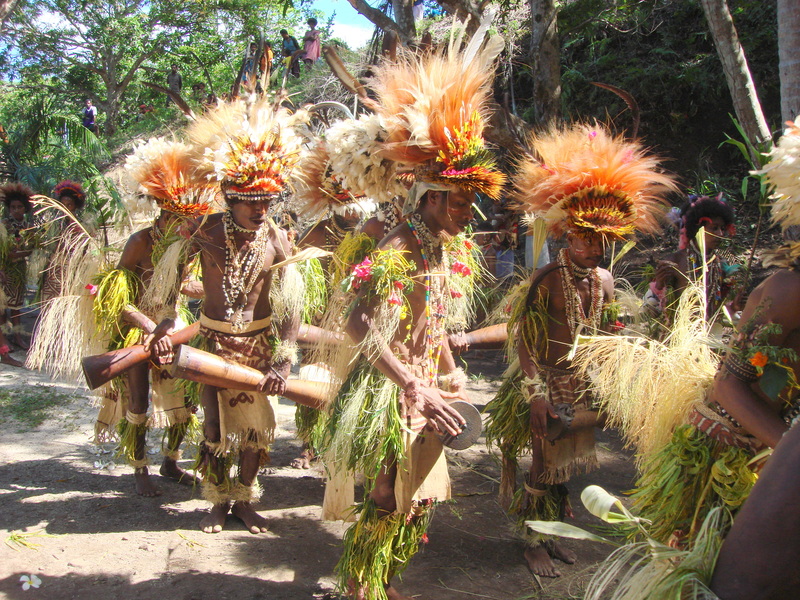 Beautiful headdresses made of Bird of Paradise feathers were worn by most of the natives and all wore their handmade tapa cloth skirts. 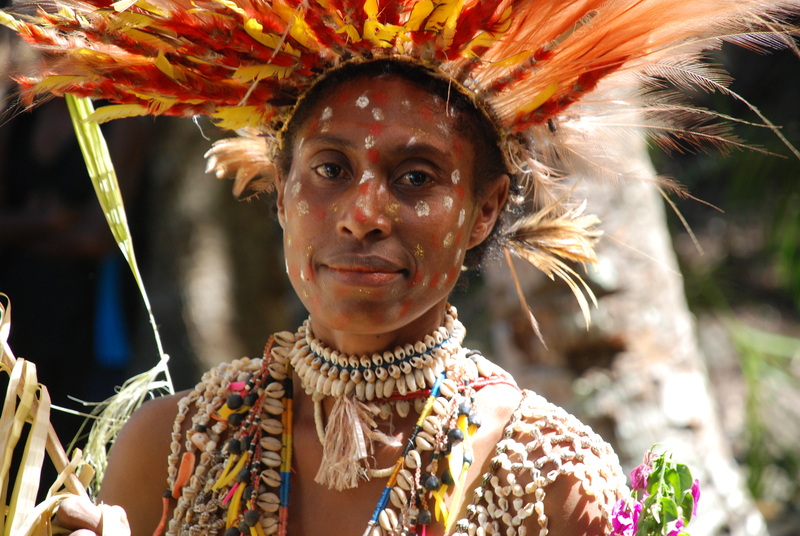 Papua New Guinea is, undoubtedly, one of the world’s last wild and undiscovered places. And this rare experience will continue thanks to Tauck World Discovery, Robin Tauck, and Justin Friend with the ORION Expedition Cruise Ship. Tauck believes in giving back to the people and countries visited through sustainable tourism. 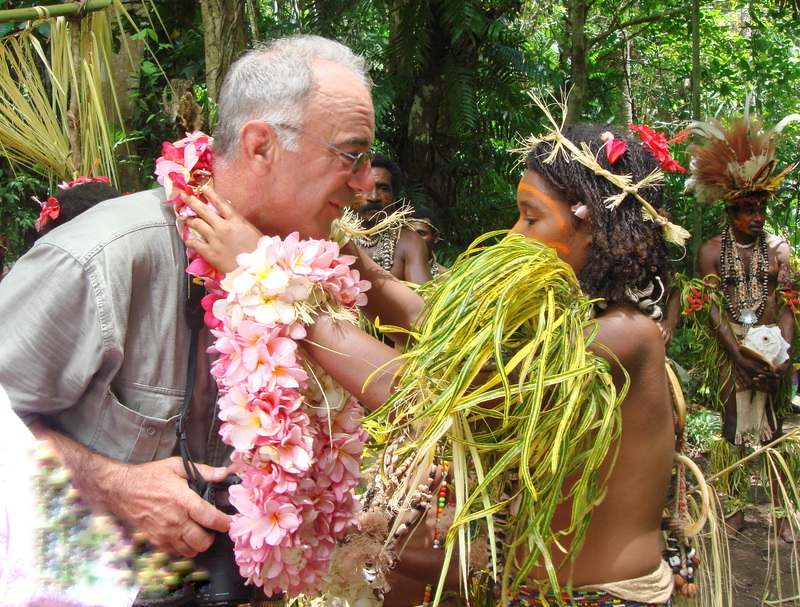 Robin Tauck was among the first persons from the outside to visit Papua New Guinea and arrange for this expeditionary tour. On this tour, she brought the natives much needed medical, school and clothing supplies and she formed a relationship with the places visited, with the local culture, and the natural environment. Robin works together with the people who live there and partners to enhance and protect for the future. 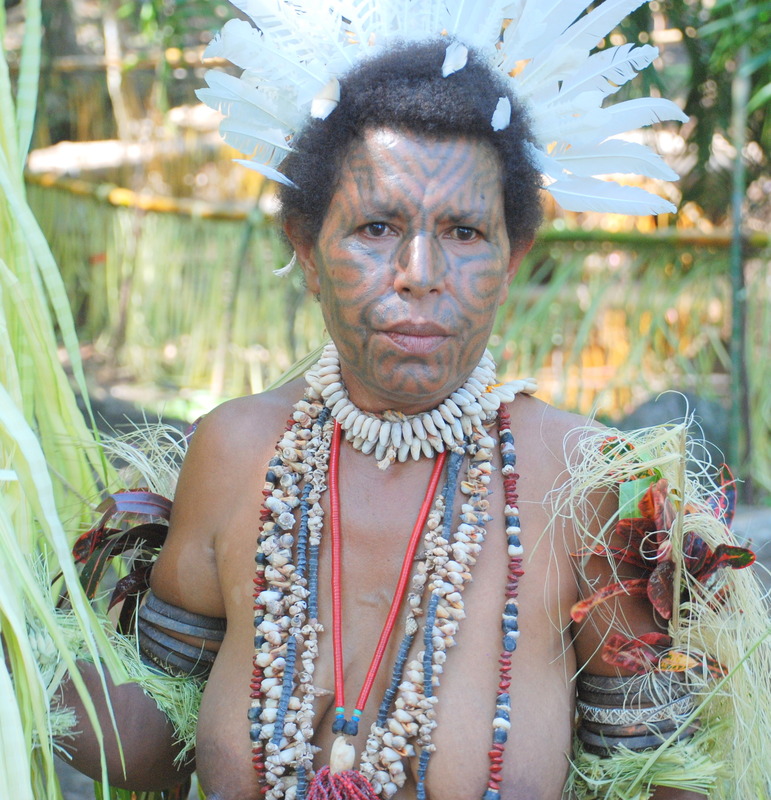 She certainly has built a relationship with Tufi, and the natives of Watam, Kitava, Bilbil, and Panapompom, Papua New Guinea, for I had never seen anything like this expedition before or since.